Tender little panfish -- bluegills, crappies, pumpkin seeds and small perch and bass -- are freshwater fish small enough to be cooked in a frying pan over a hot fire built lakeside. These Great Lakes and Southern favorites are best eaten soon after catching. 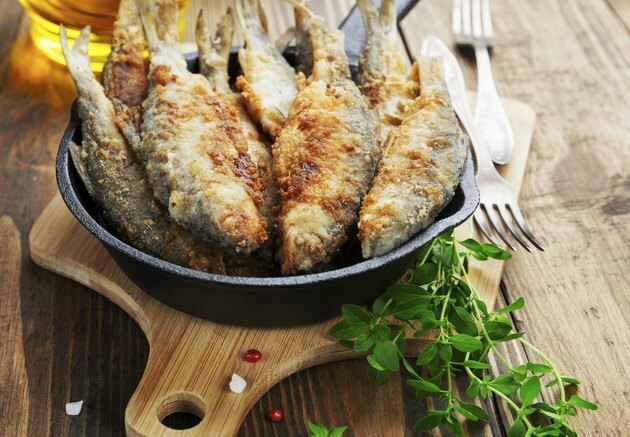 Although recipes vary according to favorite local seasonings, pan-frying is the preferred preparation and source of the bluegill's nickname. Cooks should insist that fishers gut and remove tails and fins before delivering fish to be cooked. De-scale the fish with a dull knife or scaling spoon and wash the fish in cold water. Fillet the fish by drawing a fillet knife down the backbone and peeling the fillet away between the ribs and second set of bones. Remove the second bones as you peel the fillet away. Soak the fish in a beaten egg, 1 cup of milk or Italian dressing. Use enough to coat the fish completely. Season flour or cornmeal with salt, pepper, garlic powder or other seasonings in a bowl. Drop the fish into the mixture and turn, a piece at a time, until coated evenly. Place fish in about 1/8 inch of oil in a hot pan and fry for four to five minutes on each side. Fish will be flaky and white when done. Serve with a garden salad and hot rolls or Italian bread. Serve the fish with capers sauteed in lemon butter or with lemon wedges as garnish. Bluegills can be sautéed without any coating, but just salt and pepper. Saute them in a hot iron pan. Or try sprinkling them with Italian dressing and baking them in aluminum foil in a fire that’s burned down to coals for eight to 10 minutes, depending on the size of the fillets. Garnish them simply with lemon or lime for a beachside dinner and serve them with a warm German potato salad or cool veggie pasta salad. Use crab chips, a spicy chip available in the Mid-Atlantic region, for a crunchy coating that requires no seasoning. Always take care when cooking over an open fire and use potholders when handling hot cooking pans. Allow aluminum foil to cool a bit before opening a cooking packet -- it will be full of hot steam as well as tasty fish.